We know you love brunch, especially those on your balcony or patio (sometimes waiting in line is just too much to ask on a Sunday morning). Yet, forgoing the weekend sleep-in seems almost unfathomable for us 9-to-5 professionals. So, time and again, we find ourselves mixing batter or poaching eggs at 7 am in order to have sufficient time to clean up and set the table in a hurry. Since calling a caterer is not an option, here are a few tips for a smoother make-ahead brunch. By using the right utensils and ingredients, you can stay at home, eat great food, and spend time with your friends sans stress. Sheet Pans to the Rescue! Make sure you have at least 2 sheet pans and 2 rectangular oven-proof dishes. The humble sheet pans come in extra handy in big-batch cooking and preparation, as they can hold and cook different ingredients in the same oven without the babysitting or constant flipping. For example, bacon crisps itself on a sheet pan without greasing up the whole kitchen. If you want to bake multiple dishes in the same oven, just make sure to put the oilier ingredients on the bottom shelf. Some kitchen utensils may sound old-fashioned, but they are time-tested staples—the thermos is one of them. It does an excellent job in keeping the coffee hot, and most importantly, tasty. The hot plate on the coffee maker will overheat and burn the coffee, thus resulting in a bitter taste. Moreover, contact with air oxidizes the coffee, which makes it actually taste stale. Fill your thermos with freshly brewed coffee till the very top and seal; this should keep the coffee fresh and hot, or your cold brew, strong and crisp. If your mind is set on eggs Benedict and none of our other eggcellent dishes can change your mind, you can poach the eggs and keep them warm in 75°C/170°F water in a large thermos. This temperature will keep them warm and the yolks runny. It is a universal fact that the eggs sense your fear and won't poach well if you are doing it in a hurry. Poach before your guests arrive, keep them in a thermos, and assemble the eggs Benedict or avocado toasts with your friends at the table. One of brunch’s signature dishes is cinnamon buns, or really, any sticky buns or rich bread. Served with jam or dressed in a hot glaze, these homemade enriched breads legitimize eating desserts at breakfast. Yet average yeasted breads require at least 2 hours of rising in a warm place, which conflicts with our plan to sleep in. The hack here is to make the dough the night before and cover it in plastic wrap in the baking tray. After rising slowly in the fridge overnight, you can take them out in the morning and let the dough come to room temperature while the oven preheats. The slow rising time develops subtle yeast flavors and gives the bread a dense, chewy texture. If you are not such a sweet tooth, try our tear-apart Mozarella Tomato Bread—because nothing beats cheese! Another brunch staple, quiche, can also be made ahead. Blind bake the crust the day before, prepare the filling, and seal well with plastic wrap. It literally takes one minute to whip up the quiche on the brunch day. 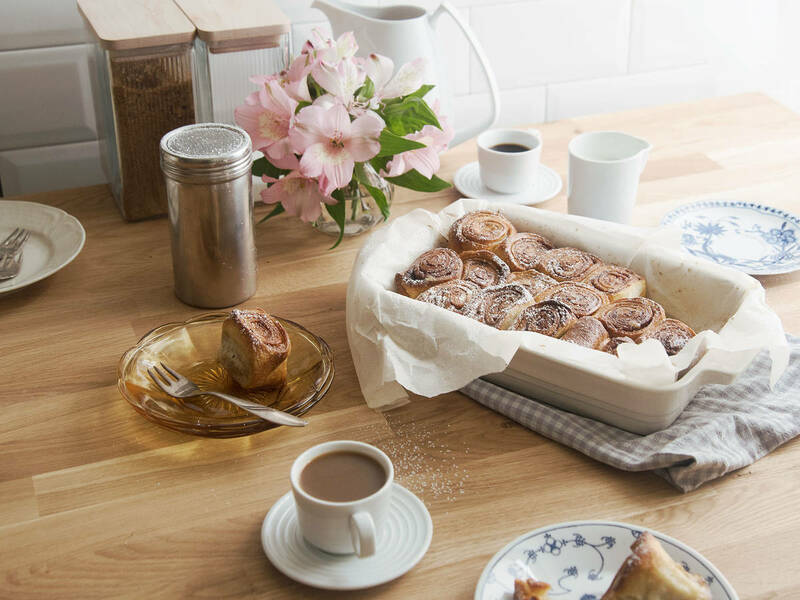 Thanks to square ovenproof pans, you can even bake it simultaneously with the cinnamon buns on the same rack! We like to host and we want to give our friends the best brunch that we can. But, don’t be shy to ask them to bring croissants from the good bakery in their neighborhood, or assign them to become the head of mimosas or the chief of the bloody Mary pitcher. Hosting brunch is about having a good time with your friends and enjoying the well-deserved weekend. As Julia Turshen famously said in Small Victories, “there is no such thing as a cooking emergency.” The food will taste extra tasty because you are among friends. Equipped with these new tips, you’ll probably want to give homemade brunch another try. Share your brunch tips with us, or just send us a picture with your happy guests!